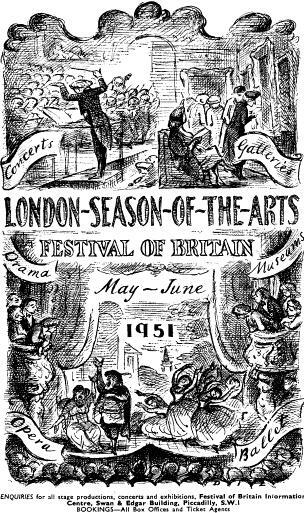 ....we opened at the Savoy Theatre on Monday, 7th May, 1951, for the Festival of Britain Season. I knew very well that the point would not be missed by the audience, and I did not want to make any obvious gesture to indicate Churchill. As I suspected, the first line brought a roar. At "never mind" there was a further and bigger roar, and so far I had avoided any glance at Churchill. Then I suddenly realised that Gilbert had written the third line to perfection for accompaniment to the slightest and most delicate of hints. "And st-st-st and What's-his-name" I sang, and then, one quick look at "Winnie" as I went on "and also — well, You know who." Never have I heard such an explosion of laughter. The expression goes "the house fell in" and for a moment I was almost afraid it literally would. Malcolm [Sargent], in the Pit, doubled up, and nearly forgot to go on conducting. All my nervousness disappeared and the butterflies in my tummy ceased to flutter; how could one feel nervous in the face of such enthusiasm?" 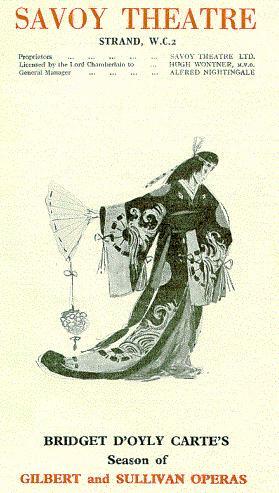 7-30 [PM] :— Savoy Theatre : "The Mikado" (Act I). 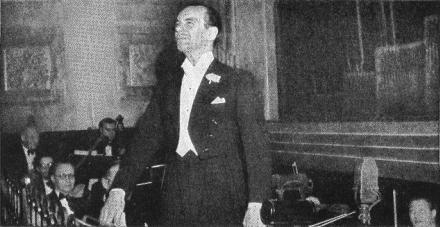 Sir Malcolm Sargent bows to the audience before conducting the opening performance of the Festival of Britain season of Gilbert and Sullivan operas at the Savoy Theatre, 1951. A BBC radio microphone can be seen in the pit at the front of the stage. There exists the possability that this broadcast may have been recorded "off air" by listeners who owned domestic reel-to-reel tape recorders at the time. Domestic recorders were available for the home market in the U.S. around 1950, but the first reference to tape recorders in contemporary editions of The Gramophone was in an article published in January, 1953 which noted that there were currently more manufacturers of such machines active in the U.K. than there had been twelve months previously. However it is likely that tape recorders were being imported into Britain in the early '50s prior to their local manufacture. Sir Malcolm Sargent renewed an old association with Gilbert and Sullivan last night when he conducted the opening performance of the D'Oyly Carte's London summer season, not this year at Sadler's Wells but once again at the Savoy Theatre. 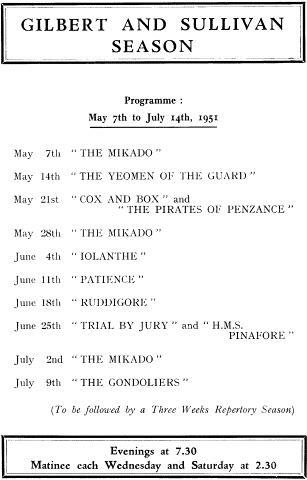 Because of the indisposition of Mr. Darrell Fancourt, the part of the Mikado was sung by Mr. Radley Flynn; otherwise it was an evening of familiar faces, which could be relied upon to raise all the time-honoured laughs in the time-honoured places. Mr. Martyn Green, the life and soul of the party as Ko-Ko, had his little fan in readiness for the umpteenth encore of "Here's a how-de-do"; the Pooh-Bah family pride glowed strong as ever in the ample breast of Mr. Richard Watson; there were the cardboard lovers of Mr. Neville Griffiths and Miss Margaret Mitchell. The wonder of it all is that the town of Titipu never, apparently, loses its fascination for those who inhabit it night after night, while the ever faithful audience resembles the small child hungry to hear its favourite fairy-tale read yet again even while knowing every word by heart. The general standard of singing was more or less adequate for the homely demands of the music, and Sir Malcolm's lively tempi, though at first a little quick for the clearest enunciation, ensured a scintillating evening.